How do you order Paroxetine 30 mg online? You can only order Paroxetine 30 mg if you have been given a prescription for it from your doctor. If you have a prescription you can buy Paroxetine 30 mg from YouDrugstore. We are an online pharmacy based out of Canada. That means when you purchase Paroxetine 30 mg from YouDrugstore you pay the same price that Canadians pay. Just register on YouDrugstore.com and then send us your prescription. Once we have received all of the necessary information from you our team of experienced pharmacy technicians and physicians will review your order. To speed up the process ask your doctor to fax us your prescription directly from his or her office. 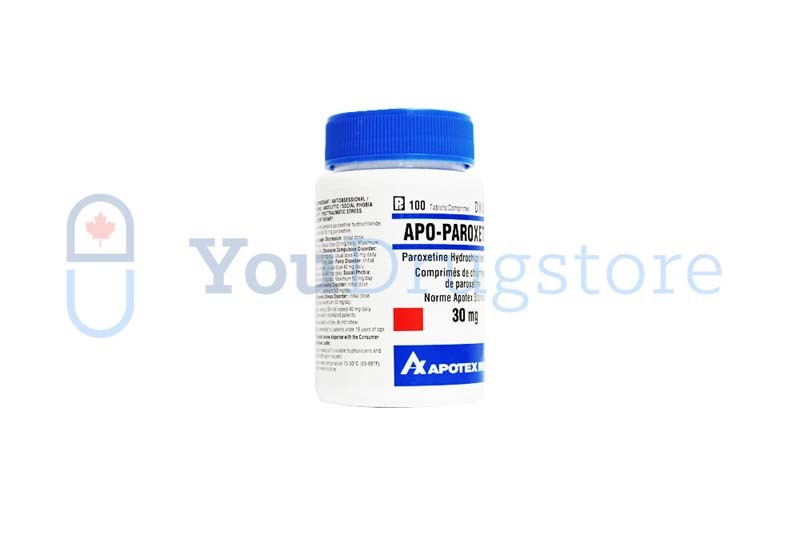 When you purchase Paroxetine 30 mg from YouDrugstore we will ship your order directly to your home for a cheap cost in shipping. YouDrugstore also provides free shipping on any order over $100. Paroxetine is used to treat depression, anxiety, and several other mental disorders. It is the generic version of Paxil. Order Paroxetine 30 mg from YouDrugstore and get generic Paxil to treat your disorder. Who might receive a prescription for Paroxetine 30 mg from their doctor? Do not take Paroxetine 30 mg if you are pregnant or breastfeeding. Never take Paroxetine 30 mg if you are allergic to it or any of its ingredients. Your doctor has prescribed Paroxetine 30 mg likely to treat depression, but it is also often prescribed to treat other mental disorders; including panic disorder, anxiety, post-traumatic stress disorder, and obsessive-compulsive disorder. Obsessive-compulsive disorder (OCD) is a disorder where people feel they have to check, do, or think things repeatedly to the extent that it disrupts their daily life. Post-traumatic stress disorder (PTSD) is a disorder where people experience extreme anxiety attacks that occur due to prior traumatic experiences. Panic disorder is when someone is prone to recurring panic attacks due to anxiety. If you believe you or a loved one are suffering from one of these disorders speak to your doctor immediately. Why is Paroxetine 30 mg prescribed to treat depression? Many mental disorders are linked to abnormal levels or activity of neurotransmitters in the brain. The neurotransmitters that doctors believe are most responsible for your overall mood, anxiety, and sleeping patterns are serotonin and norepinephrine. Paroxetine is a selective serotonin reuptake inhibitor (SSRI) which means that it causes an increase in your overall levels of serotonin. It does this by preventing certain cells in your body from absorbing serotonin, which means the serotonin in your body begins to build up. It is believed that if you have more serotonin your brain is more capable of managing your mood and sleep patterns. Paroxetine is also the generic alternative to Paxil, which has been prescribed to treat depression for over 20 years. It was also the first medication in the US to be approved for the treatment of panic attacks. 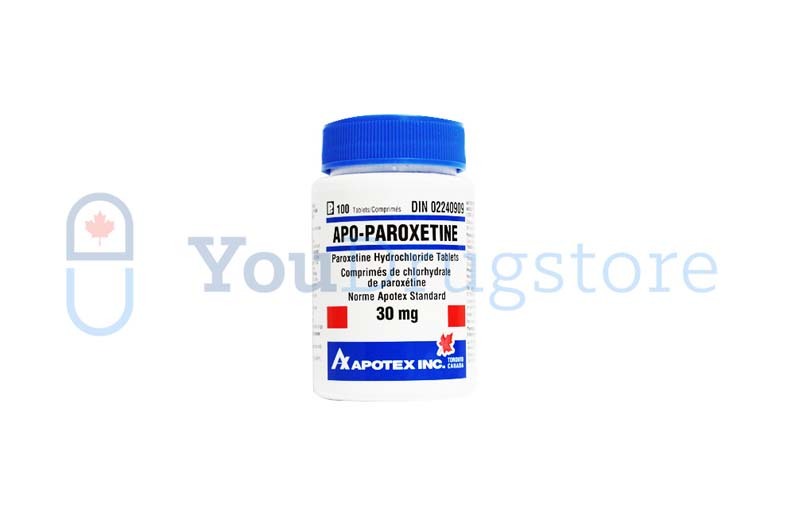 Order Paroxetine 30 mg from YouDrugstore today. What are the side effects of taking Paroxetine 30 mg? As with all SSRIs, when you take Paroxetine 30 mg you may experience some side effects. Most side effects are simply just a sign that your body is either adjusting to the medication or that your dosage needs an adjustment. Always tell your doctor immediately if you experience any severe side effects. The most commonly reported side effects associated with taking Paroxetine 30 mg include nausea, dry mouth, constipation, diarrhea, hyperactivity, some sexual dysfunction such as erectile dysfunction, nervousness, drowsiness, blurred vision, headache, insomnia, sweating, tremors, tingling, and a loss of appetite. If you have any concerns about taking Paroxetine 30 mg speak to your doctor. When should you take Paroxetine 30 mg? Generally, Paroxetine 30 mg is taken once every day. You will need to take Paroxetine 30 mg once every day for several weeks or even months before you may notice any benefits. Thus, do not stop taking your medication even if you feel better. Also, suddenly stopping your medication can cause serious side effects. Always take Paroxetine 30 mg exactly as your doctor has prescribed. Your doctor may also change your dosage several times as you progress throughout your treatment, this is normal. If you have any questions about taking Paroxetine 30 mg call your doctor. Where can I learn more about Paroxetine 30 mg?